Suzuki is very know international player for their rock solid engines and gearboxes. The Gixxer 155 proudly carries down this lineage. Everything about the engine and the gearbox of the Suzuki Gixxer 155 is slick and smooth and stormy. The 5 speed gear box has a very cocky and precise feel to it. Go for one test drive and see how engine performs.you will see how quick it will reach 100 kmph in fourth gear at 8k RPM in 15.45 seconds. It will do a comfortable 100 kmph in 5th gear at 70500 RPM. The best feature of this engine though is the fact that how incredibly refined it is. Even at its limit there are absolutely no vibrations. The best part about this new Suzuki is the way it handles. The chassis, which Suzuki says has been designed keeping in mind the design pattern of the Hayabusa and the GSX-R1000, is just AWESOME. 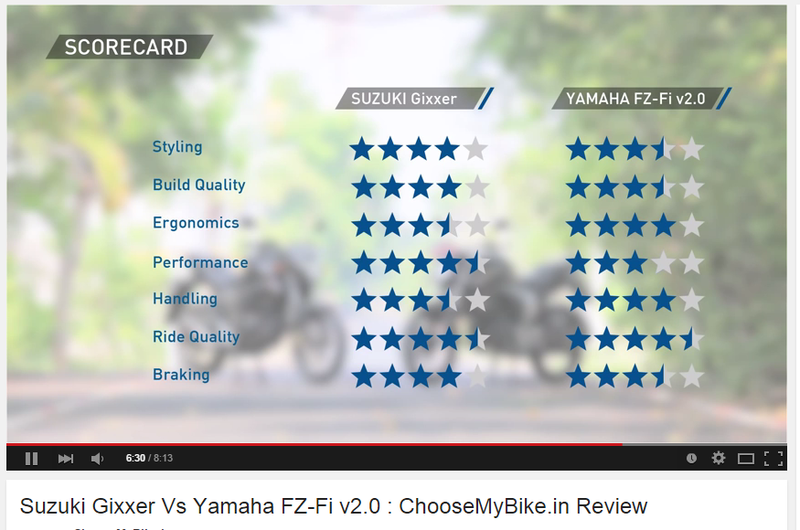 Hope this will help you in choosing right bike. MY HONEST FEEDBACK AND OBSERVATION ABOUT GIXXER155 ABOUT COMPLETING 6000 KM. 4)Almost VOID vibrations even at higher RPMS. I Have enjoyed highest speed of 114 .Cocky gixxer builds up speed very easily and deceptively. Within no time, I am cruising at 80-90 kmph with void vibrations at all. It's only beyond 100 kmph that I feel minor vibrations in the foot pegs. Suzuki Motorcycles India Limited unveiled their new flagship commuter bike, Suzuki Gixxer in Mumbai on January 27, 2014. 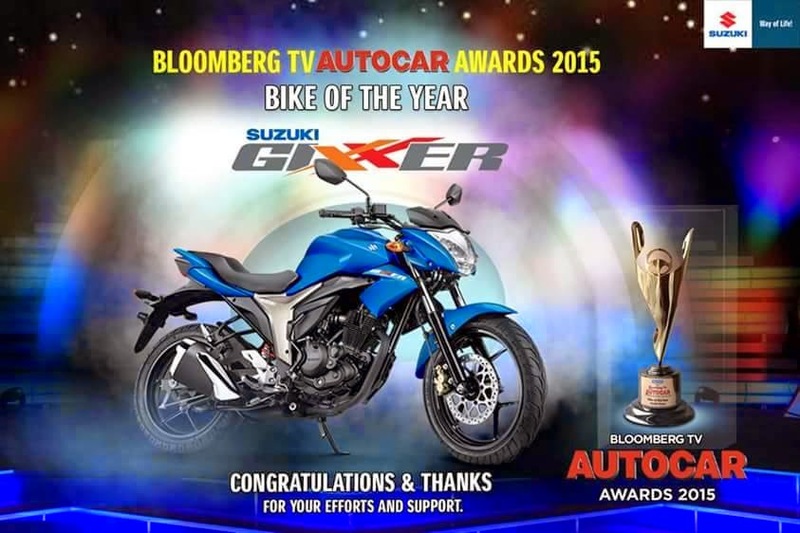 The company made it official and the bike was on display at the Delhi Auto Expo in February, 2014. It was unveiled by Suzuki's brand ambassador Salman Khan. It is expected to be launched in a few days and will compete with the likes of Honda CB Trigger, Hero Xtreme and the Yamaha FZ/FZS. The company said that this 150cc bike will give an exceptional riding experience and has best fuel economy in the class. Suzuki Gixxer has got a sporty resemblance due to its stylish and eye-catching design, engine in black, a single seat, black rear view mirrors on a nicely positioned handlebar, comfy footrests, a well sculpted fuel tank, a stylish silencer, kick as well as electric start, turn indicators at front and rear, halogen headlamp at front, bright tail light, rear grab rail, 17-inch cast alloy wheels with wide tubeless tires. The bike has a light and stiff frame with the engine having a SEP (Suzuki Eco Performance) technology to provide a strong acceleration and good torque. The Suzuki Gixxer features a fully digital instrument console that comprises of a fuel gauge, speedometer, tachometer and dual trip meters along with low fuel and low battery indicators. The amber colored light is used in LCD which gives it a futuristic look and provides better illumination. The dimension figures of Gixxer include a length of 2050mm, width of 785mm and height of 1030mm along with a kerb weight of 135Kgs. It also features a sturdy fuel tank with a capacity of 12-litres which gives you a decent range. 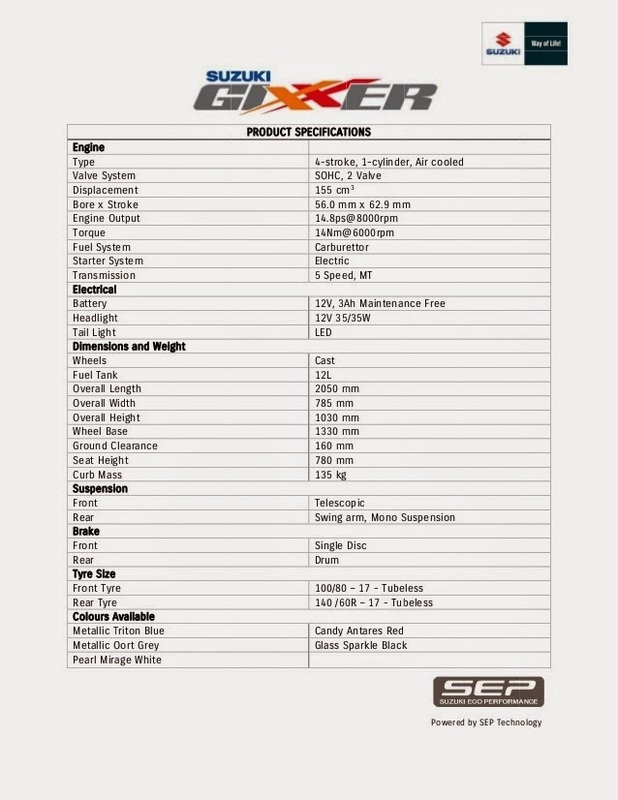 Suzuki Gixxer is powered by a 154.9cc, 4-stroke, single cylinder, air-cooled, two-valve, SOHC, carburettor-fed petrol engine that generates an impressive power of 13.94 bhp at 8000 rpm and a peak torque of 14 Nm at 6000 rpm. The engine is mated to a 5-speed transmission and a multi-plate clutch which works in a 1-down and 4-up shift pattern. It has a bore into stroke ratio of 56.0 mm and 62.9 mm respectively. The motorcycle has got 240 mm disc brakes at its front and 130 mm drum brakes at the rear end which works efficiently and smoothly. The suspension duties are handled by telescopic forks at the front while swing-arm with mono-shock absorbers are placed at the rear. It is a great fun to ride this amazing motorcycle. The wheelbase of 1330mm and ground clearance of 160 mm protects the bike from damages. The six-spoke alloys are standard to this commuter with a 100/80-17 inch tubeless tyre at the front and a 140/60-17 inch tubeless tyre at the rear. The bike is stable around edges and can easily pave through city traffic. The Suzuki Gixxer is dipped in five attractive shades which are Pearl Mirage White, Metallic Triton Blue, Glass Sparkle Black, Candy Antares Red and Metallic Oort Gray. 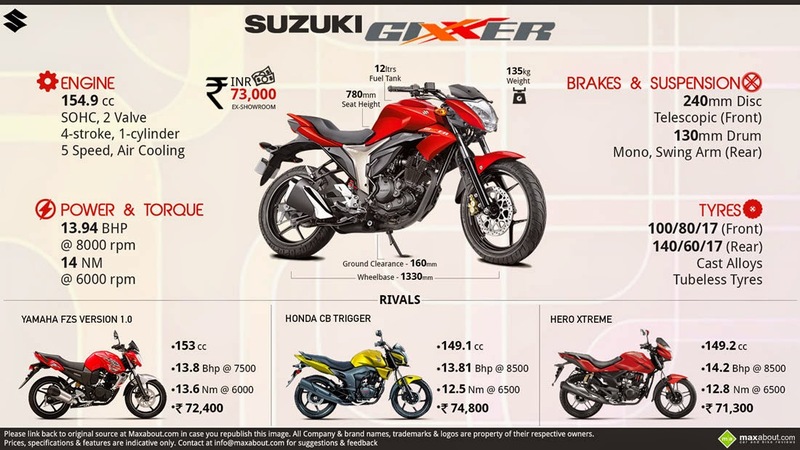 The expected ex-showroom, Delhi price of Suzuki Gixxer is INR 73000, which may vary. 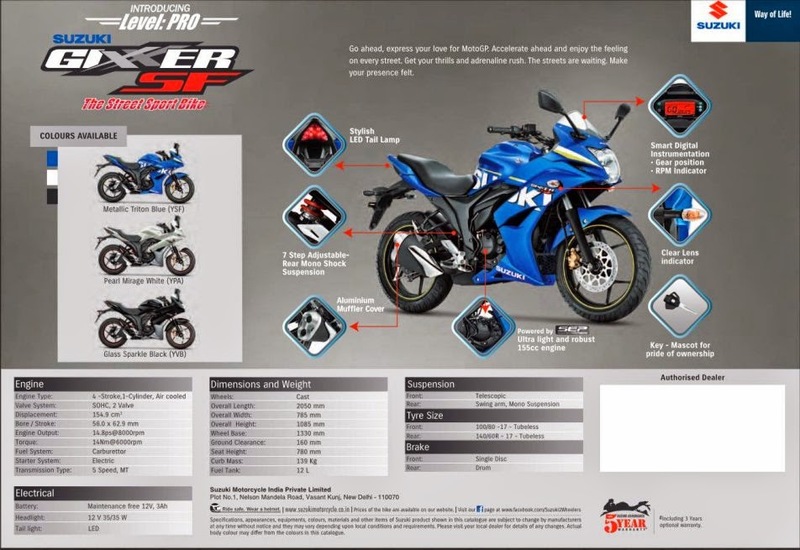 the premium looking Suzuki Gixxer SF is a fully faired 155cc motorcycle which has aerodynamic full sport fairing. Suzuki Gixxer SF has been developed in the same wind-tunnel where the legendary Hayabusa, GSX-R and MotoGP machines are developed. The fairing has been designed to give maximum wind protection to the rider, reducing turbulence and drag, thereby delivering great aerodynamic efficiency. Every feature of the new Gixxer SF is designed to give a sporty and premium look - from its futuristic-looking aluminum exhaust end cover, new clear lens indicators and pinstripe on the wheels gives it a sharp, edgy look, guaranteed to appeal to all motorcycle lovers! 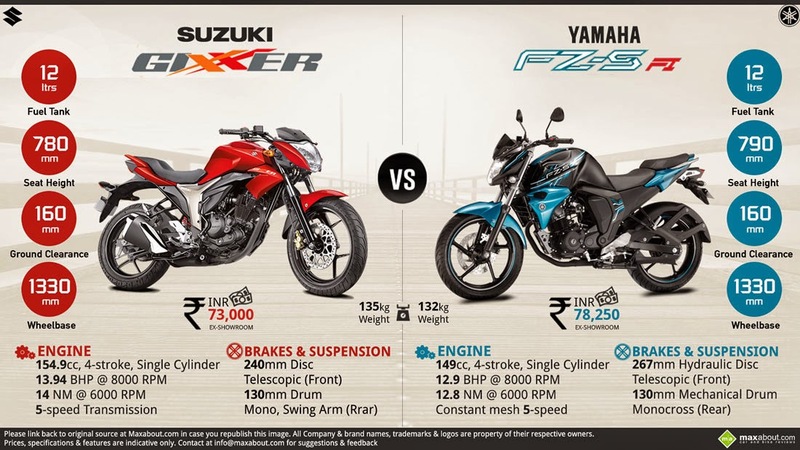 There are number of two wheeler manufacturers in India such as Honda, Suzuki,TVS,Hero and Mahindra. Honda and TVS are two most trust able brands in Indian market, The brand value also help in re-sell of bike. Very important factor to be consider, You can buy a good two wheeler within a budget of Rs.60,000. Ready for little more to pay for new launched bikes with extra features and colors. Women should really need to take care of this point, now a day’s there are low weight bikes are available but its extremely important to check the weight of the two wheelers so you can ride comfortably. Helmet is now getting compulsory, So one should check the storge for the same and so many girls stuffs too. Also it should have enough space for Sunday shopping items. A good two wheeler should give you a mileage of 35 to 40 kms per litre, Do not get confused with Highway mileage consider the city traffic and small roads. I find this another important factor after weight, Most of the girls are at shorter side and two wheeler should not be too high else it will uncomfortable for you. Kick-starting a two wheeler is not easy for every woman, through its very simple but Check for Auto Start and battery durability. Check out the review of the bike, it doesn’t make sense to make a hasty decision and settle for something that simply looks good and offers more mileage. New Style and Colour are the fist choice of girls,Pink, while,black and blue are the very popular colors, cute but should be durable. The location of your service center should be near by your area, during any emergencies you should not land up traveling long distances for repairs and services. Servicing and Maintenance of two wheeler is very important, It makes traveling very convenient because of low running and maintenance costs mean you can get many miles of drive. All the newly launched two wheelers company does not have their spare parts easily available in the market, Consider this points in your list for future. 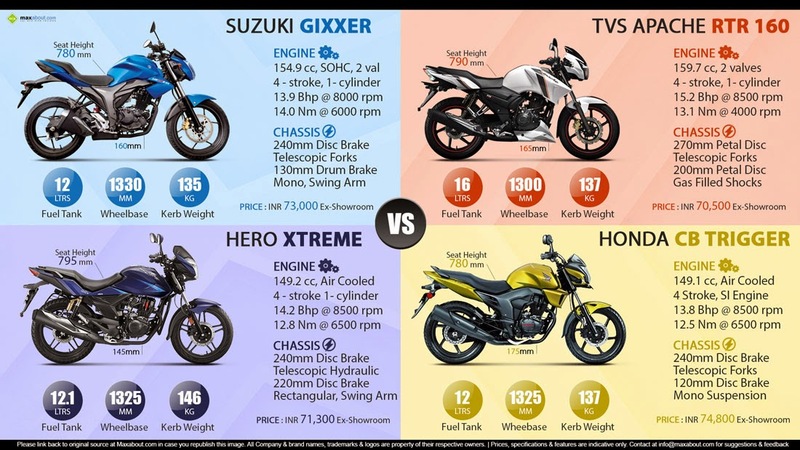 Resell price is totally depends upon the Brand, Year and current condition of bike, A branded bike could give you better deal as compare to other two wheelers. Suzuki pulled the wraps off its new GSX-S1000 and GSX-S1000F models at the opening of this year's International Motorcycle Show in Cologne, Germany, as the Japanese manufacturer unveiled several new models and updates that will form part of its 2015 model range. The product concept behind Suzuki's new super-naked was to provide the spirit of GSX-R in a naked streetbike chassis. Designed for nimble and agile handling, the GSX-S1000 features an all-new frame and utilises engine design and characteristics from the iconic GSX-R1000 K5, famed for its low-down torque and mid-range power. With knowhow from MotoGP development, the GSX-S1000 benefits from a traction control system boasting three-modes as well as the option to switch the system off completely. ABS is also available, with the bike expected in dealership showrooms in late spring next year. Also unveiled as part of Suzuki's new GSX-S range, the F variant features all of the benefits afforded to its naked sibling, including an all-new frame, traction control and ABS, but wrapped it in a newly designed fairing. Designed with the same concept in mind, the GSX-S1000F shares the ergonomics and riding position of the naked version, with both aimed at providing a sporty ride on the road, but leaving customers with the choice of added weather protection or sheer naked aggression. It too, is expected in late spring. The new Address 110 is expected to arrive in early spring next year, and brings with it exceptional fuel economy and value. Boasting 139MPG* and a 5.2 litre fuel tank, the Address 110 is set to become the commuting scooter of choice. Practical touches include under-seat storage in excess of 20 litres that will comfortably take a full face helmet and riding gear, and rear handbrake for use when parked. The Address benefits from a new fuel injection system and reduced overall weight, which comes from sporty, redesigned bodywork and cast aluminium, hollow-core wheels. Based on the already popular V-Strom 650, which has been the top selling dual-purpose machine in the 650-800cc class in the last decade, the V-Strom 650XT comes with more adventure as standard. The new V-Strom 650XT takes design cues from the DR Big, the first dual-purpose machine to feature the now standard 'beak' design synonymous with models in the adventure sector. A new beak blends smoothly into the existing front bodywork, with air ducts that channel airflow to the radiator. Newly designed, lightweight, wire-spoked aluminium wheels aid in the adventure-styling of the new V-Strom 650XT, and shock absorption performance is increased on unpaved roads. Its arrival is anticipated as early as December this year. Bandit is back for 2015, with the iconic machine on sale in the UK early next year. With the original Bandit models developing a cult following, the latest incarnation uses the newest version of Suzuki's 1255cc inline four-cylinder engine and gets a styling update to bring it into 2015. After repeated wind tunnel testing, the redesigned fairings, with new radiator shrouds, offer improved aerodynamics, with venting just below the headlights, as well as better wind and weather protection for both rider and pillion. The A2-licence friendly and ideal commuter, comes clad with a newly designed fairing for 2015, with the Inazuma 250F unveiled at Intermot. Adding extra wind protection to the popular city-wise machine, which boasts an impressive 85MPG figure, cost conscious commuters can now travel even further in comfort. The new faired Inazuma will be on sale in early 2015, alongside the existing naked machine. The iconic GSX-R1000, which took the win at the prestigious 24 hours of Le Mans earlier this year in the hands of the Suzuki Endurance Racing Team, now comes with ABS as standard for 2015. As the Japanese brand celebrates its return to the blue-ribband class of motorcycle racing next year, the GSX-R1000 will also be available in the replica colours of Suzuki's new MotoGP racer, the GSX-RR.